Ready to step back in time into the Ice Age? On New Zealand’s West Coast, rainforest-clad valleys dip into spectacular glaciers. Its most famous glaciers, Franz Josef and Fox Glacier, draw travelers from around the world to hike and explore their stunning ice formations. From blue ice caves to rippled ice currents, stepping onto these glaciers is like stepping into a completely different world. 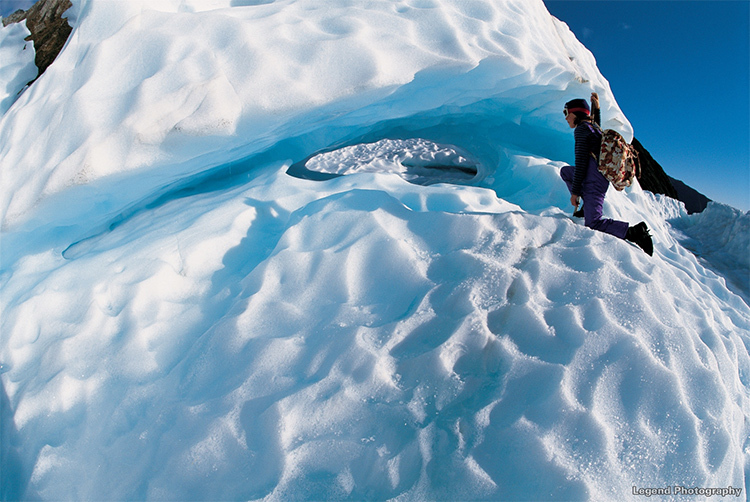 Franz Josef and Fox glacier both provide an array of activities for all levels. From glacier valley walks to glacier hikes and scenic helicopter rides, seeing these natural wonders is easily done on your terms. Fox Glacier is a 13 kilometer long (8.1 mi) glacier, the longest of New Zealand’s West Coast glaciers, located in Westland Tai Poutini National Park. With gorgeous ice caves and dappled arches, Fox Glacier is one of the most accessible glaciers in the world. During the high tourist season it sees about 1000 people daily. The glacier was named after one of New Zealand’s Prime Ministers, Sir William Fox. Its official name is Fox Glacier / Te Moeka o Tuawe, incorporating its original Maori name. Still flowing almost to sea level, the front of the glacier, known as the terminal face, rises at a slow incline, making valley walks and ice hikes fairly easy. However, shelving in the valley deep beneath the glacier causes the ice to crack and slide, constantly changing the face of the glacier along with surface melting. Guided tours are a must to get on the ice due to these unstable conditions. Yet these changeable conditions can present breathtaking surprises along the way. The Fox Glacier township, “Weheka,” lies 4 miles from the glacier with a population between 300 – 400 residents. With delightful cafes, restaurants and glow worm caves just a short walk from the town center, this cozy township will warm you up with its genuine Kiwi hospitality. 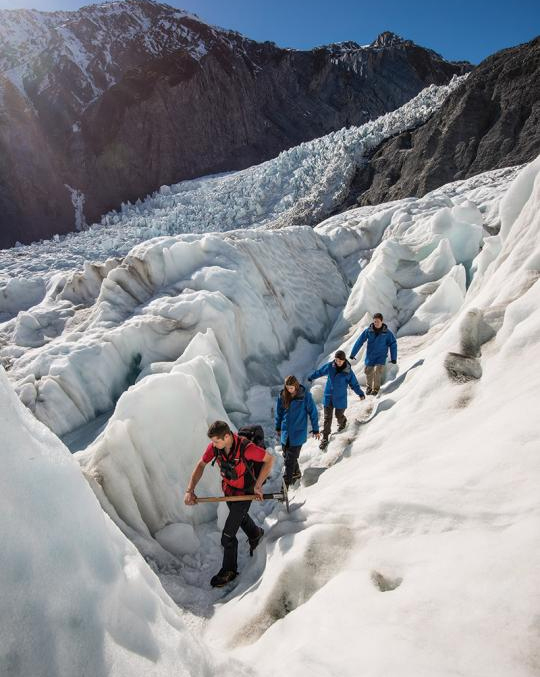 Visitors can walk close to the face of Fox Glacier, but a guided tour is where the real adventure lies. Venture through the pristine Fox Valley toward the face of the glacier on a terminal face walk. This moderate trail is the perfect way to get closer to the glacier than any unguided walkers without leaving your footprints on the ice. Walk along the flowing Fox River, emerging from the ice, as your expert guide brings the dynamic terrain to life with their informative commentary. Come across fantastic ice boulders and if you’re lucky, you might witness extraordinary ice collapses. Combine the thrills of soaring high above the ice and walking the spectacular glacier formations on a Heli Hike on Fox Glacier. Flying in by helicopter allows you access to remote parts of the glacier where its dynamic forces work hardest and create stunning ice caves and arches. Once you land your guide will fit you with crampons, spiked footwear used for secure mobility on the ice. One of the biggest differences between Fox Glacier and Franz Josef is in how they are guided. Fox Glacier, with its extremely varying conditions, offers more spontaneous hikes set by your guide as you make your way. A tour on one day may be completely different than a tour the next day. As you step through narrow ice caverns, a blue glow emanating from the icy depths, you’ll feel like you’re on an expedition in the Arctic. The photo ops will be out of this world. With a length of 12 kilometers (7.5 miles) and a steeper drop from the Southern Alps, Franz Josef constantly shifts, create rippled ice formations and icy crevasses. Guided walks and hikes on the glacier are usually on pre-cut and predetermined paths, more suitable for beginners. This also affords more opportunities to see extraordinary ice formations. Located in Westland Tai Poutini National Park only 12 miles away from Fox Glacier, you can easily see the face of both glaciers on a quick road trip. But you’re in New Zealand’s West Coast, where the scenery is as varied as the continuously changing glaciers. Become one with the landscape and explore these incredible rivers of ice. 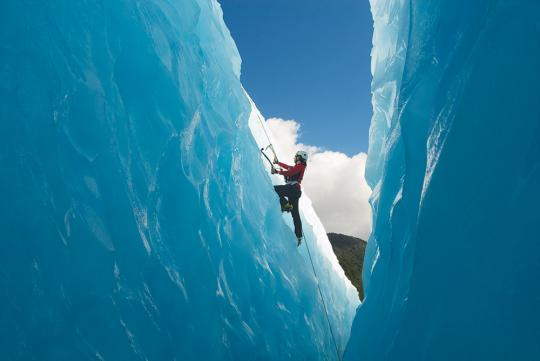 Get your heart racing with an exciting Heli Ice Climb on Franz Josef. Offering some of the best glacier climbing in the world, this experience rewards you with unique views and an unbeatable sense of accomplishment. You’ll begin with a scenic helicopter flight, surrounded in the full panoramic majesty of the glacier and nearby mountains. Once on the ice your guide will lead you to your climbing starting point, where your adventure begins. With all technical equipment and climbing gear provided, the Heli Ice Climb serves all skill levels with expert guides instructing you along the way. The high you’ll feel as you reach the top of the blue ice will be just as thrilling as the jaw-dropping scenery around you. For those seeking the beauty of the glacier at a slower speed, try the two hour Guided Glacier Walk. You’ll take a flight up to the top of the glacier and get to see the beauty of the surrounding mountains as the guide lets you explore the awe-inspiring formations. This adventure gets you up close to the blue ice tunnels, between towering walls of ice and in the ice caves carved out of the glacier. Your guide will reveal extraordinary knowledge of the glacier along the way, leaving you with a deeper understanding of why this special landmark is so special. One of the highlights of a Franz Josef excursion is complimentary access to the Franz Josef Hot Pools. What better way to soothe your tired muscles after an incredible hike out on the ice? The township of Franz Josef also boasts an array of accommodation and places to grab a bite to eat, setting up the perfect stay for your Franz Josef adventure. Whether you want to take a heli flight to the top of the glacier and walk around, or just want to see where the glacier runs into the waters below, there are glacier experiences fit for every person’s adventure level. Don’t miss out on this gorgeous sight you can only see in New Zealand. If you are ready to start planning your glacier exploration, call us Toll Free 888-359-2877 (Mon-Fri 8:30am – 5:00pm Central US). I Want to See New Zealand’s Glaciers!